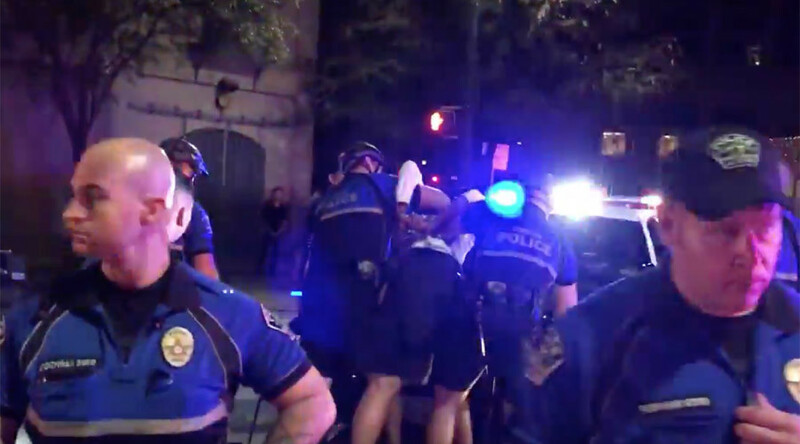 A video that has gone viral online shows Austin, Texas police beating up and arresting two men early Friday morning for allegedly jaywalking. They subsequently arrest a third man and a woman who had witnessed the incident. The Austin Police Department (APD) said it would investigate the situation that led up to the arrests, and whether the officers’ actions had been in compliance with departmental policy. An APD spokesman told the Houston Chronicle he did not know why the men had been stopped or what charges had been filed against them. The video opens with several white police charging towards two African-American men walking along the sidewalk and smashing them against a storefront. Initially, two officers pin one of the men against a storefront, who is quickly handcuffed and taken away off screen. Meanwhile, one of the officers from that group peels off to join two other officers, one of whom is pummeling the other man with several punches to the head as law enforcement tells the man to be still. A third officer joins in and throws blows to the man’s arm. “What did I do?” the man asks repeatedly. Police tell bystanders they are taking the man to jail, while bystanders ask what he had done. “Crossing against the light,” an officer says in an apparent reference to jaywalking. “I’m handcuffed already, you can get your knees off me,” the man on the ground says. A man and a woman, who appear to be friends of the two men being arrested and who were questioning the police’s actions, are also arrested in the video. The video had already garnered 20,000 views five hours after being posted Friday. A week ago, Austin police began a “pedestrian enforcement” initiative near the campus of the University of Texas, where they stopped, warned or ticketed jaywalkers. Earlier in October, local KUTX radio reported that police had begun a “No Sit/No Lie” citations program, a quality of life program allowing officers to issue tickets to someone for sitting or lying down on a city street or sidewalk for more than 30 minutes at a given time. A standard ticket is for $160, plus community service hours. If defendants don’t appear in court, the cost of the tickets increases to $210. Nearly 60 percent of defendants don’t appear and don’t pay the fines, which turns the tickets into outstanding warrants. Homeless advocates say the program unfairly targets homeless people, effectively criminalizing them for being poor. KUTX said violations have been increasing over the last four years, and many expect this to continue as Downtown Austin attracts more tourism. This is not the first time the city’s arrest policy for jaywalking has come under question. Last year, the city made international news after police beat up a jogger for jaywalking. In that incident, a student jogger, Amanda Jo Stephen, didn’t stop when police attempted to issue her a jaywalking citation. Some witnesses said she hadn’t heard the officers, as she was wearing earphones. Police contend that the officers were clearly visible to her. At a press conference concerning the incident, Austin Police Chief Art Acevedo quickly came to the defense of the arresting officers, saying they may have been rough with the female college student, but they hadn’t raped her. Stephen was one of 28 people who were stopped for jaywalking that day. A total of seven pedestrians were issued citations. Jaywalking alone is an arrestable offense in Texas, according to Texas University law professor, David Gonzalez.